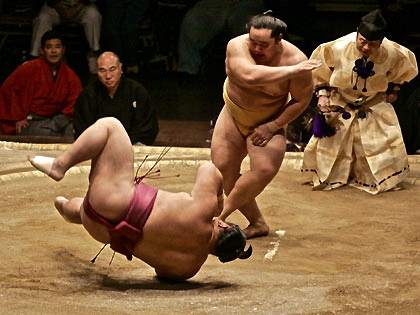 Although Japanese are typically short and slim, you find Sumo wrestlers quite fat ! 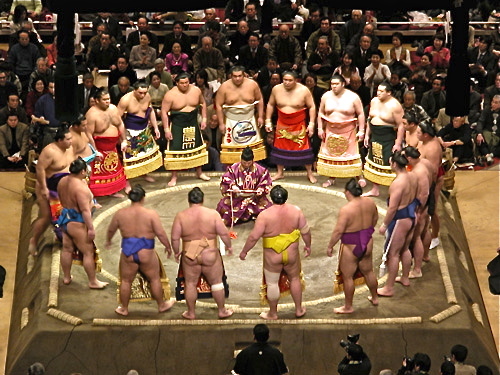 The Sumo game is the traditional Japanese wrestling, which has centuries of history in Japan. The game starts with both wrestlers stretching out, some times several minutes, and then siting on their feet. The first wrestler to force his opponent to touch the ground with any part of his body other than the bottom of his feet. Spreading salt on the ground for each round of the game is their way to purify the dohyō. All the wresters gather around the Gyōji (referee) and do some special moves, and one will receive the certificate.